I will be at the lobby tomorrow evening after 5pm (Tuesday 3rd May). From UNISON press release "The Housing and Planning Bill is nearing its conclusion in Parliament, it returns to the Commons on 3 May, when it will be debated by MPs. This is a crucial debate that could see the Bill voted into law.UNISON is concerned that the bill, if it is passed in its current form, will result in fewer social and affordable homes, housing jobs and services for citizens and the vulnerable. That is why we are supporting this lobby on Tuesday 3 May as part of the Stop the Housing Bill campaign. 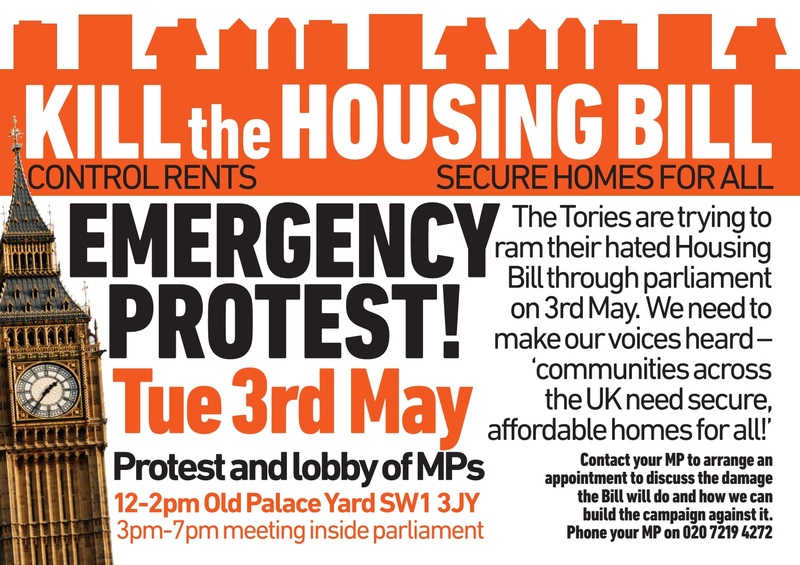 The lobby gives campaigners, housing workers and citizens the opportunity to meet with their Member of Parliament to tell them what is wrong with the Bill and how it will impact on local communities and the housing options of ordinary citizens.